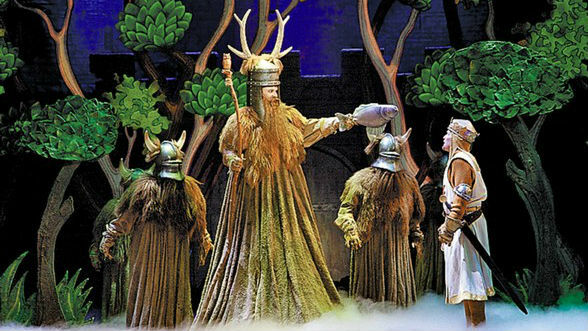 A scene from "Spamalot" at the Moonlight State in Vista. 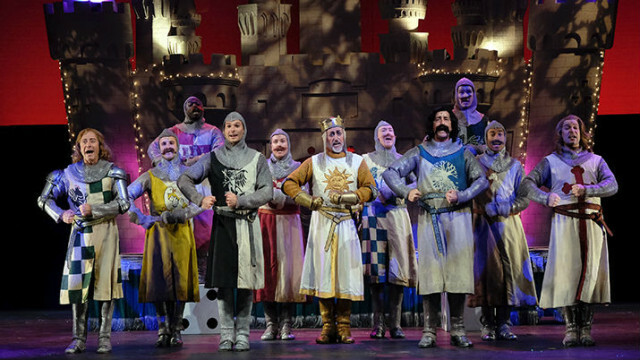 The knights sing in Moonlight Stage's production of "Spamalot." Hold your (faux) horses! The coconut-clapping hooves are clopping again, King Arthur and his Knights have returned. Silliness reigns supreme in the Tony Award-winning “Spamalot,” which is getting a superb airing at Moonlight Stage Productions in Vista. Having the original Broadway sets and costumes doesn’t hurt. The whole stage has been transformed into a medieval castle. Director Brad Bradley was a member of the original cast and national tour, so he knows every move, and re-creates the outrageous choreography of (former San Diegan) Casey Nicholaw with precision. Of course, a crackerjack cast helps – and Bradley has assembled a stellar team; the singing and dancing are nonpareil. The robust, horn-heavy orchestra, under the baton of music director Lyndon Pugeda, sounds much larger than its 14 pieces. Each of the Knights gets to shine; they’re all first-rate, separately and together. The Vegas schmaltz of Camelot, the uproarious number, “You Won’t Succeed on Broadway” (…if you don’t have any Jews), the abusive Frenchman, the Killer Rabbit, the Knights Who Say Ni. It’s all there, hewing closely to the 1975 film, “Monty Python and the Holy Grail,” borrowing from Python bits gone by. Though the musical frequently goes over the line in its punning and funning (well, the book and lyrics were written by clever Python Eric Idle, who also co-wrote the music — with John Du Prez — so what do you expect?). There’s no highbrow humor here, unless you want to count the source material, the legend of the Knights of the Round Table. But there are so many versions of that tale; this one’s just a little wackier than the rest. And, adding in the Broadway-skewering satire, it’s an evening of pure, mindless, laugh-out-loud, goofball fun. “Spamalot” runs through June 28, at Moonlight Amphitheatre in Brengle Terrace Park, 1200 Vale Terrace Drive, Vista.